We all want to play like our idols, or at least get close to them. In this lesson I’ll show you five great rock licks which you can start to use in your solos from the playing of some of the biggest stars in the rock scene. A Tony Iommi style lick similar to something that he plays in his “Paranoid” solo with Black Sabbath. A wicked Slash lick similar to something he plays in his classic “Sweet Child ‘O’ Mine” solo. Zakk Wylde style lick. You’ll know this great guitar player from Black Label Society or from Ozzy Osbourne’s band. Here is a high energy, repeating lick from him, which I’m sure you will find a use for! Randy Rhoads style. A classic Rhoads lick from his epic “Mr Crowley” solo. After learning these licks, you will have some awesome new ideas for your solos. Also remember to change them these examples a bit to get licks of your own. Grab the tabs to these licks and lesson notes by clicking the link below! Rock Licks – 5 Super Hot Rock Guitar Licks – in the style of Slash, Tony Iommi, Zakk Wylde, Angus Young and Randy Rhoads! 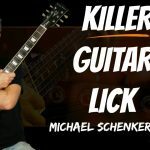 Learn these 5 high energy rock guitar licks in the style of guitar greats like Slash, Angus Young, Zakk Wylde and others. In this guitar lesson I’ll show you how to play 5 rock licks and how you can slip them into your guitar solos and kick your guitar soloing up a gear. Sound good? 0:15 Hear me solo using some of the rock licks you’re going to learn in this lesson. You might recognise some of them from the playing of guitar legends like Slash, Randy Rhoads, Tony Iommi, Zakk Wylde , Angus Young and others! 1:03 All these licks use the minor pentatonic scale and the blues scale. Here you’ll learn how to play an E blues scale pattern. This lick is like Tony Iommi plays in ‘Paranoid’. It’ll sound great slipped into your rock solos! It uses the E minor pentatonic or blues scale pattern we looked at earlier.Watch for the ‘rolling’ technique I show you to get clean, clear notes at the 12th fret on top 2 strings! Angus plays a lick like this in his solo on ACDC’s ‘You Shook Me All Night Long’. It’s using the G minor pentatonic scale which Angus has move up to the 15th fret instead of playing it at the 3rd fret. By moving any scale up 12 frets like this you can play the same pattern and licks an octave higher – useful tip! Note the use of ‘pre’ bends and double stops. Take these ideas and insert them into your own playing. This is a favourite of all rock players – but one of the best known uses of it is in Slash’s solo on ‘Sweet Child ‘O’ Mine’ by Guns’n’Roses. It’s using 2 repeating bending ideas in E minor pentatonic which are repeated a number of times. The lick then wraps up with a little blues lick idea. It might take a bit of practice to build up the stamina and strength to loop this one around at speed – but keep working at it and you’ll nail it! This Zakk Wylde style lick uses the E blues scale – it’s a high energy, repeating lick which you’re sure to find a use for! Notice how we’re reaching up and grabbing a higher note on the B string as well. Practice adding this note into some of your favourite minor pentatonic licks – you’ll be surprised at how many cool ideas you can discover! Also check out the double stop bend at the end – this is a useful bending ‘nugget’ to steal for your own licks. This lick is like something Randy Rhoads plays in his ‘Mr Crowley’ solo. This lick uses the D minor pentatonic scale and is basically made up off 2 repeating licks played a number of times. The 2nd half of the lick will test your alternate picking – it might be a bit tricky! Don’t let this stop you though: use hammer ons and pull offs if that’s easier. This part of the lick is a great exercise to develop your picking skills. Start slow and gradually build it up over time. Experiment to see how to make them work best in your playing and remember to use these as the starting point for ideas and licks of your very own – super important!